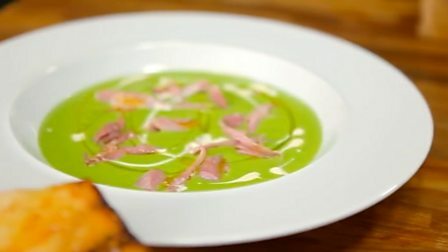 A luxurious version of ham and pea soup using poached ham hock and a judicious dash of cream. For the ham hocks, put the ham into a deep saucepan, add all the other ingredients for the ham hock and cover with water. Bring slowly to the boil, then simmer for 1½-2 hours, then remove from the heat and allow to cool slightly. Remove the ham hocks from the stock and shred the meat from the bone, reserving the ham stock to make the soup. For the soup, heat a large pan until hot, add the butter, peas and parsley then stir in 750ml/1¼ pint of the cooking liquor from the ham hock. Add the cream and bring to a simmer. Transfer to a blender and pulse to form a purée. Return to the saucepan to heat through, then season with salt and black pepper. Heat a griddle pan until hot, drizzle half of the rapeseed oil over the bread, then place on the griddle, cut-side down, and cook until charred. To serve, ladle the soup into serving bowls, top with some of the shredded ham, a drizzle of cream and the last of the rapeseed oil.